Bio: Jacques Ousson was born in 1937 at Douai (France). In 1939, he went to live with his grandparents at Ousson sur Loire, a rural commune of Loiret, 160 km south of Paris, where he spent his childhood, and whence his pseudonym. After secondary school in Paris, he trained at the l'École des Métiers d'Arts. In 1969, he returned to Ousson, far from the madding Paris crowd. 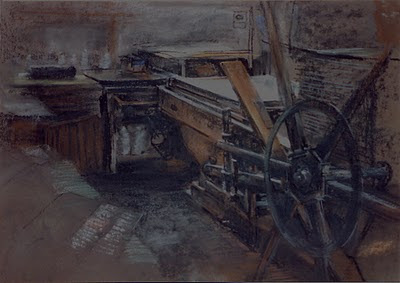 Ever since he has devoted himself to drawing, watercolour and pastel. Navigation: Website is in French. The link to the paintings is Iconographie. Gallery: Twelve thumbnails: eleven paintings and one drawing. It is not easy to decide which images are pastels, as no information on medium is given. Image View: Information on title, size and date is given as a tool tip if you rest the cursor on the thumbnail. Each thumbnail opens in a new window when clicked. The enlarged images may be downloaded. File size of Ancienne Presse is 1024x725, 265 KB.